This is sort of the feeling of modern Shanghai during Expo - a blaze and a blur of light. 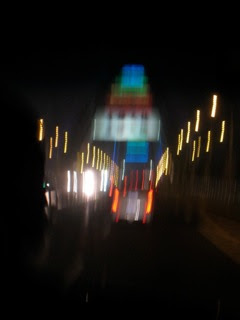 This is the famous bridge - which changes color which goes by the Expo site. Our patron group had enjoyed our session at the Conservatory, and had dinner at the intimate Foo Yong Elite Club. 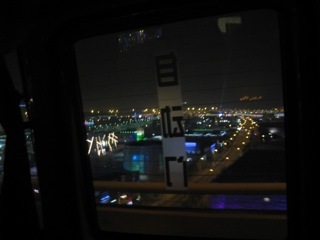 On the way back they drove by the Expo site to look at the pavilions which are lit. 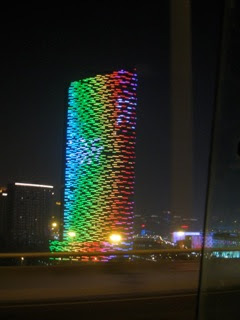 Many other buildings are lit as well. 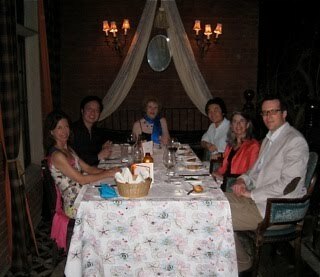 Our Board members Ann Goodbody and Kathy Henschel, Ann's friend Florence Lidell, La Fugue's Olivier Lucciani, Zheng Zhou, professor from the Shanghai Conservatory and the Conservatory's choir conductor enjoy outdoor dinner at the Foo Yong Elite Club a beautiful and historic setting in which one feels far away from modern Shanghai. Matt entertains our French friends (he speaks French.